It always bugs me, as someone who thinks local produce tastes better than stuff trucked in from Off, to see Red, White and Blue recipes using fresh strawberries alongside fresh raspberries and fresh blueberries. Why? Wherever I've lived, those berries are not simultaneously in season. Late spring is the time of the strawberry, and the raspberries and blueberries come along later in Summer. If I'm going to combine berries, I'll need to use some that are put up (by freezing or by jammin') so that I can get the best flavor. Beets are one of the vegetables that we don't devour within days of getting them in the farm share [beet greens, however, I adore and gobble up ASAP]. Beets are long-storing, though, and freeze beautifully after roasting, so in the winter I'll often grab a bag of roasted beets out to thaw and then decide what to do with them. Adding roasted beets to muffin batter makes a naturally vibrant result [even in savory form]. I wanted to make a colorful muffin so a beet base seemed like a good way to start. 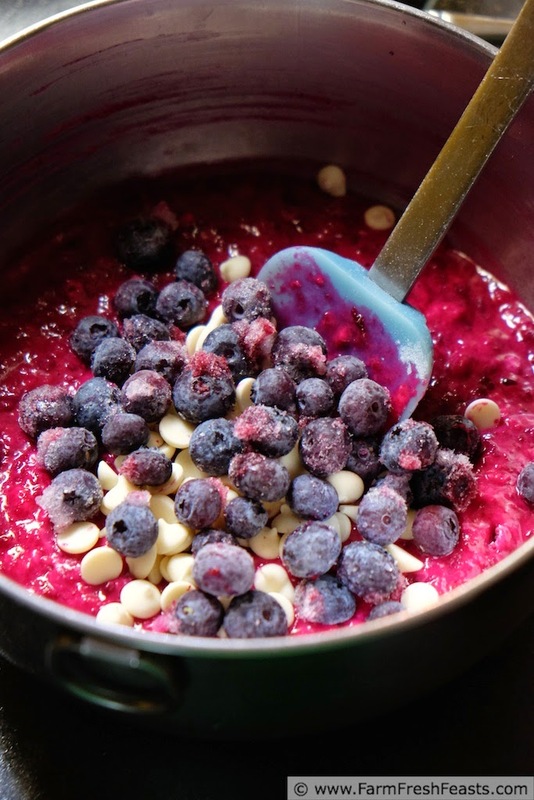 Strawberry jam for summer flavor, plus blueberries and white chocolate chips, make this muffin on the sweet side for my baking--but with only ¼ cup sugar it's still a snack I'm jiggy with feeding my kids. For other recipes using beets, please see my Beet Recipes Collection. For other recipes using blueberries, please see my Blueberry Recipes Collection. These collections are part of the Visual Recipe Index by Ingredient. After typing so much to give you A Peek into My Process I'm going to jump right to the recipe. Preheat the oven to 400 degrees Fahrenheit. Spray a 12 hole regular muffin tin with oil spray or line with paper liners. In a large bowl [and using a whisk for best results] combine beets, jam, oil, sugar, milk and egg. Toss the whisk in the sink, you're done with it. Dump dry ingredients (flour through baking powder) on top of wet mixture. 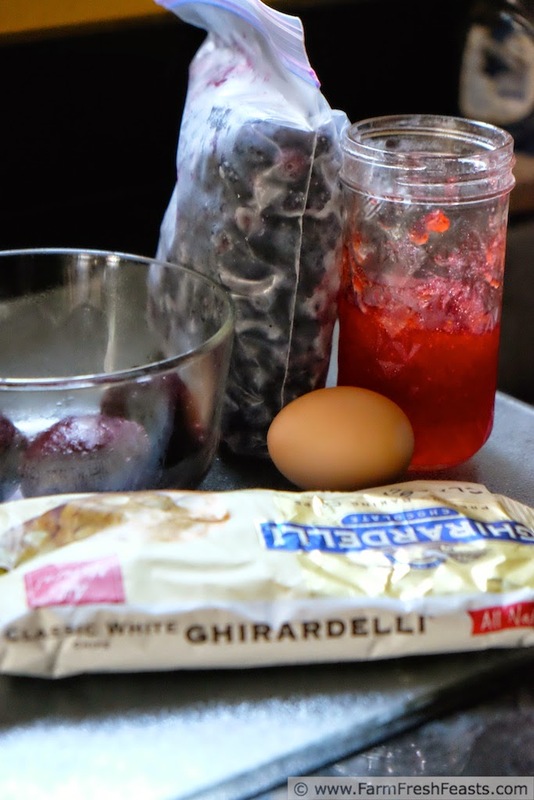 Stir until nearly combined, then fold in blueberries and chocolate chips. Scoop** into prepared pan. Bake for 18 minutes, then cool in pan 5 minutes before removing from pan and cooling on a rack. Serve warm or room temperature. First- I love the idea of Muffin Monday! 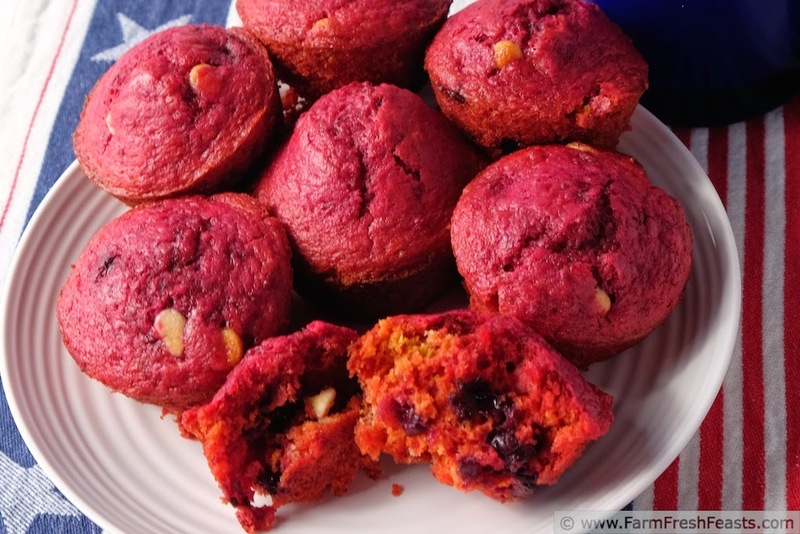 I definitely need to make some muffins up today :) Second those beets make such an amazing color- perfect to celebrate, no need for red #40 or anything fishy. I'm always amazed at the shocking color beets give to my muffin batter or pizza dough. Every once in a while I've taken a stab at a red velvet cake, but the inside always bakes up kind of a yellow-orange. Tastes fine, misses the mark of brilliantly-colored naturally red cake though. 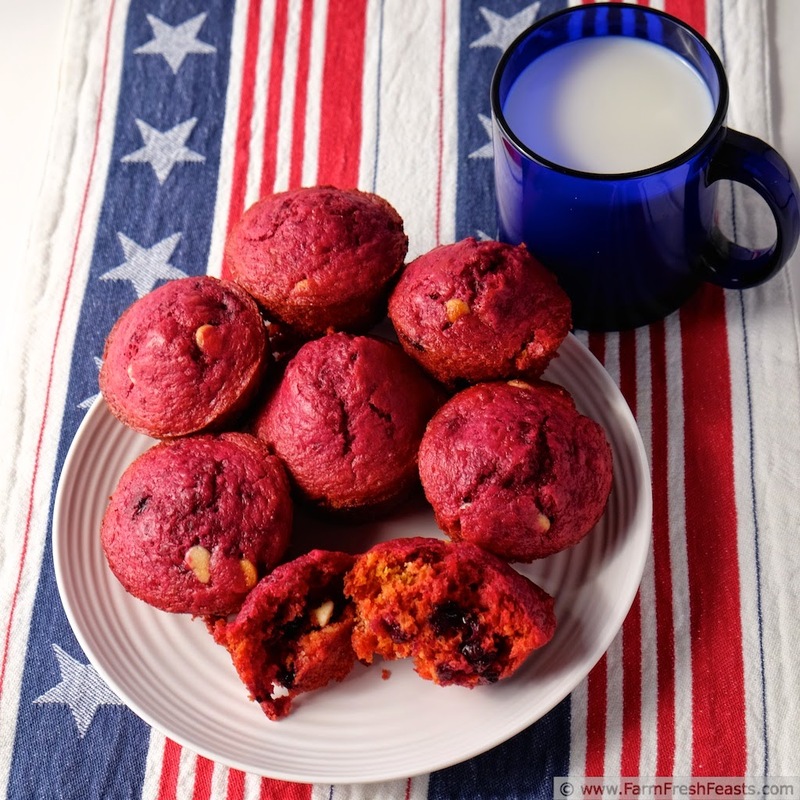 I've never been big on red, white and blue food, but I love the idea of these muffins, especially with a bit of beet for color and flavor! Blue food gives me pause, primarily because I think of those blue raspberry slurpee frozen drinks at the convenience stores. I can get my head around white food though--cheese, rice, alfredo sauce all are right up my alley! 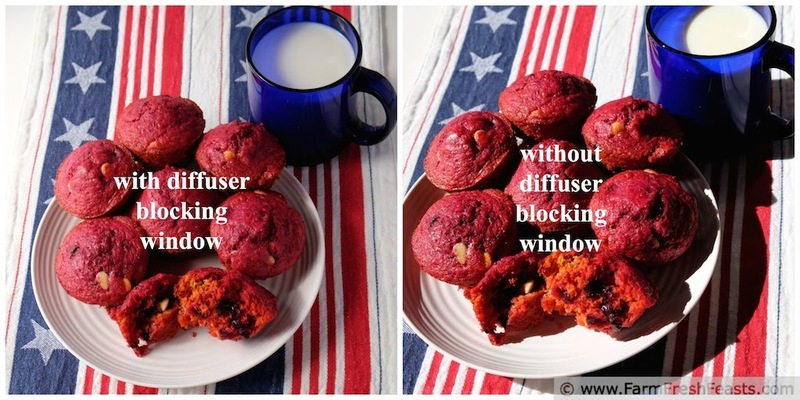 You can absolutely tell a difference using the diffuser and not. I've actually been trying to move my food into the shade so I don't get direct sunlight. That's when I'm photographing outdoors. I may have to try cooked beets again seeing as how none of your muffin recipes have ever led me astray. In fact, I've been craving your savory butternut squash ones lately. I think I still have some frozen shredded squash so it might be possible. I got beets in the farm share this week (along with seven different types of greens!) and I'm having an internal . . . well I guess now it's out in the open . . . debate about cooking them or eating them raw. Got to deal with the greens first, it's all I can focus on to be honest. I also need to defrost the fruit & veg freezer to see what lurks in there. I could go for savory squash as well. Your suggestion of white chocolate chips is a brilliant one--I'm glad I listened to you! If you are using table salt I'd use a regular ½ teaspoon since I'm pretty sure it wouldn't make an overly salty muffin. The original recipe book of muffins that I got my initial proportions out of many years ago probably used table salt, so if anything my muffins are slightly under-salted. Still enough salt for the chemical reactions, though. Thanks for bringing it to the FF party! I am sure there is a rule book somewhere that defines what's a muffin and what's a cupcake--but since I'm not frosting these nor do they contain much sugar, I'm going to stick with muffins. I could try an hybridize a name, but cup-kins sounds weird, and muff-cakes takes this in a direction I do not intend to go in. Beautiful cupcakes! And thank you too for the photo tip, it's definitely good to know that. I am a visual learner, and when I can see a clear difference in photos I figure I'll help out fellow visual learners like me. Wow, this is actually my second beet muffin recipe on the blog--first the savory horseradish ones and now this sweet version. Oh do these look delicious! Hanging my head in shame...I am one of those people who will eat blueberries, strawberries, and raspberries together... :-) But back to the muffins... I love the color of them... they're so festive... so happy! I'm always looking for something to whip up to just grab and go for work, and these look like they would be the perfect thing for that! Thanks so much for sharing! Never hang your head in shame! If someone fixed me one of those pretty mixed berry concoctions you bet I'd eat it! I just can't find flavorful berries around here--except the ones from the farmer's market. In fact, now that I think on it--this morning my spouse and I walked down to the farmer's market where we bought local blueberries and could have bought local strawberries. Our raspberry bushes are ripening more berries each day, so it's totally possible--today at least--to have a flavorful mixed berry concoction in my house. Hooray! As for taking them to work--I did that the other week and got a thumbs up from my coworkers. I'm continually learning to improve my food photography--and it's spilling into other types of photography as well. Most of it I've learned from my spouse--he takes terrific photos--but there's so much more to learn. I know there can be a time and a place for food coloring, but not these muffins. Not when I've got beets from the farm share! I know there is a time and a place for food coloring, but not these muffins! These look amazing! 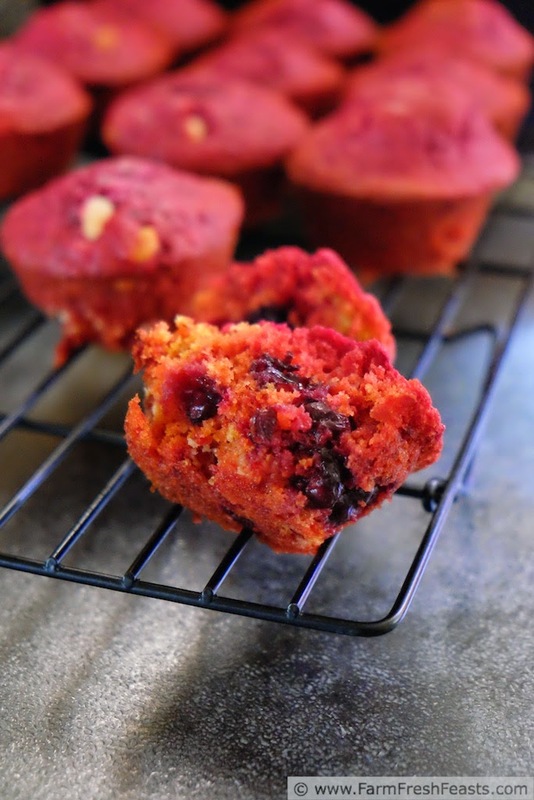 I love the idea of using beets in mufffins!! 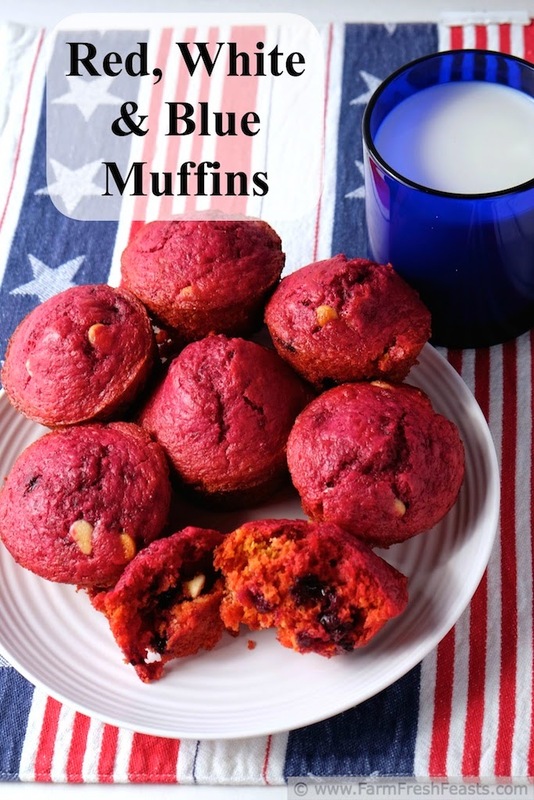 I'm glad to find like minds regarding beets in muffins. I keep trying new variations!